After many delays, we finally managed to leave Rome by noon. Drove through what seemed to be a more prosperous part of Italy -- houses looked cleaner, streets wider, towns newer-looking. Drove along coast part of time, saw island of Elba. At Livorno started running into Army trucks -- seems as though U.S. Army has a depot station there. As driving into Pisa, saw the Leaning Tower. It actually leans. According to the "HOTELS STOPPED AT" section of the trip diary, my mother and her friends stayed at the Albergo dei Cavalieri in Pisa, Italy. There was (and is) an Army depot in Livorno called Camp Darby. 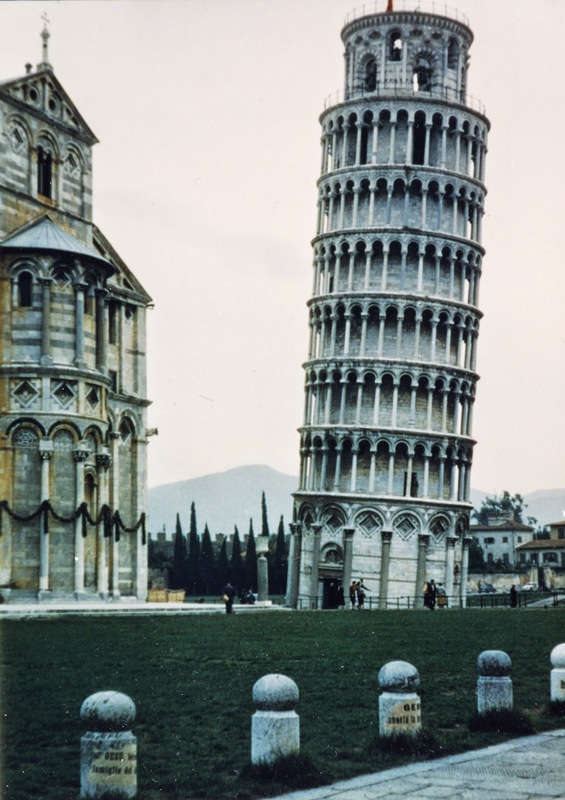 At left is a photo my mother took of the Leaning Tower of Pisa. Below is a view of the island of Elba (where Napoleon was exiled) from the area of Scarlino, a town my mother might possibly have passed through. Below that is a map with a possible route for this day's travels. This is the 56th in a series of posts transcribing entries in my mother's 1953 Europe Trip journal.